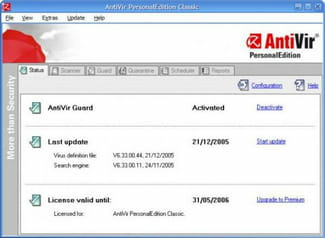 Avira AntiVir Personal is a security software that keeps your personal computer clean and safe. Its advanced features give full protection to your system. It protects against any virus on the internet. Its basic functionality is to detect viruses on your computer. Avira AntiVir Personal has different scan options : the security software can analyze the whole system or only a selected part of it. Thanks to the results of the scan, you can delete the application infected, let it run, put in quarantine. While inserting a USB key, the antivirus informs you of any kind of threats. It locates the infection and also enumerates all the infected files. When surfing the internet, the application monitors the ports used and scans the transferred data for viruses and unwanted programs. The proceedings help you browse safely in Internet. AntiVir Rootkit Protection is a module checking whether there are application that has existed in your computer and cannot be detected with conventional methods of malware protection. No need to download update files, the « update » button finds it automatically from the official website. You can get optimized multiprocessor configurations. The software has demonstrated its efficiency. The interface should be enhanced. The application requires a minimum requirement of your system. Latest update on May 3, 2015 at 11:09 AM.